Day 7-This gorgeous loop takes you inland back through the beautiful redwoods on Philo Greenwood to Anderson Valley and CA-128 W for a stop at the Historic Navarro Store. Continue on CA-128 W/Navarro River Rd and travel along the river through the dense redwood forests to the river’s mouth. Return south on Hwy 1 for a scenic run along the coast. Start the ride from the Greenwood State Beach parking lot in Elk and head south on Hwy 1. Turn right onto Philo Greenwood Rd for 17.7 miles; the first couple of miles climbs up through the gorgeous dense forests to the ridge at Cameron Rd. The sun’s rays breaks through the early morning coastal fog-it’s a beautiful sight! The road continues to roll along the ridge line apple orchards and ranches. Philo Greenwood Rd runs along the forested Greenwood Ridge with a series of ups and down and multiple high points. The last uphill pitch leads to the 3 mile descent towards Henry Woods State Park before crossing the Navarro River into Anderson Valley. At the junction; turn left and head west on CA-128; the road travels on gentle rolling terrain through the estate wineries and vineyards around the gorgeous pastoral Anderson Valley wine region towards the town of Navarro. Lunch stop at the Historic Navarro General Store; it’s a great place to sit and relax a bit! The next 14 miles on CA-128 W is quite beautiful; the smooth gentle flat-rolling terrain takes you underneath the magnificent redwood forests along the Navarro River past Dimmick Campground at Navarro River Redwoods State Park. The road emerges from the forests and travels along the north side of the Navarro River to the river’s mouth at Hwy 1-stop at the bridge and enjoy the stunning river views! Cross the Navarro River on Hwy 1 S; the road kicks up for a climb up to Navarro Bluff-it’s 0.7 miles with an average grade of 7.9%. Hwy 1 S continues on rolling terrain along the bluff past Saddle Point and Devils Basin before dropping down along Cavanaugh Gulch and Sartori Gulch. The short pitch out from the gulch goes pass Cuffey’s Point and the Catholic Cemetery at Cuffey’s Cove. Hwy 1 S rolls along the coast with wonderful views of the string of rocks around Cuffey’s Cove as it enters the town of Elk. Ride through town for return to the Greenwood State Beach parking lot. 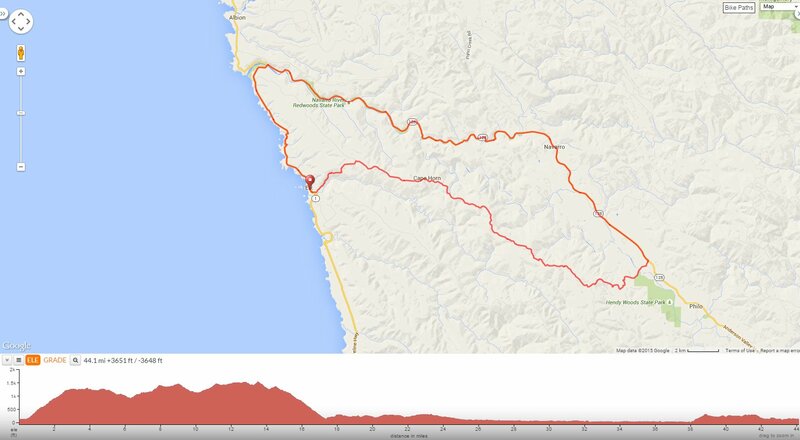 This is a splendid ride-it’s front loaded with climbing and has long gentle stretches through the gorgeous redwood forests around the North Coast! You’ll enjoy the scenic run along the Navarro River to the river’s mouth at Hwy 1 and the coastal landscape along the bluff-it’s absolutely stunning!